Today, I am happy to announce the next release of EShop Shopping Cart extension, version 3.2.0 with great enhancements for Manage Inventory. 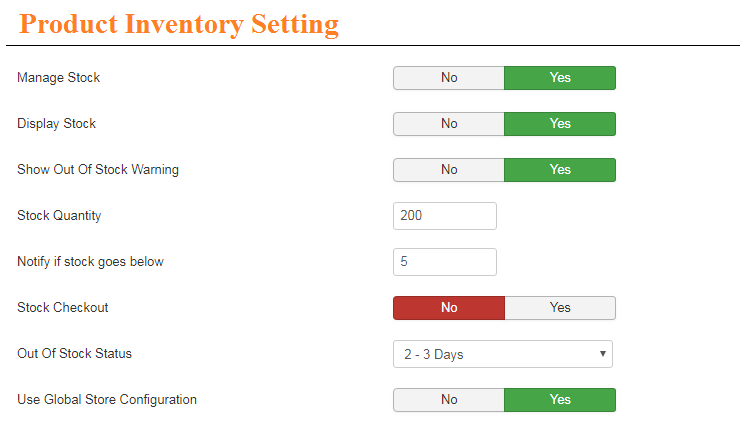 So from this version, you can manage inventory for your store easily and exactly. If you go to EShop -> System -> Configuration -> Option tab, you will see a new section for Global Inventory Setting. Under this section, you can setup the global essential options which are used for managing inventory. These options will be used by default for all products in your store. In the case you want to have separate inventory setting per product, just go to Product Inventory Setting on the next part. 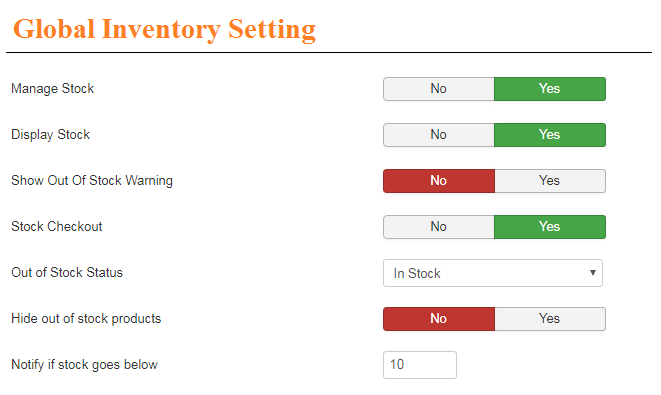 Under new/edit product screen, you have a new tab called Inventory where you can manage inventory for product easily. If Yes, then product stock will be updated automatically when processing order (new order, delete order or change order status). In the case you don't care about product stock, simply choose No for it. - Display the stock information (quantity) or simply display In Stock text when product is still in stock. 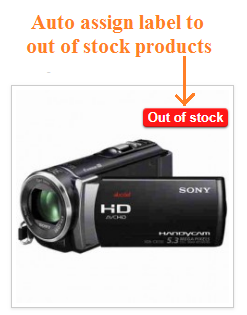 - Display Out of stock status when product is out of stock. 5. Show Out Of Stock Warning. When shoppers try to add out of stock products to the cart, there is a warning message to tell them about that. Get automatic notifications from your store for products that are reaching the low stock threshold. It will help you replenish the stock. If it is set to Yes, then shoppers can still checkout products when they are out of stock. 8. Single Page Inventory Management. Manage your inventory in a single page. No need to open every product to manage your stock. Just use the single page to view, edit and manage stock for multiple products. 9. Auto assign label to out of stock products. 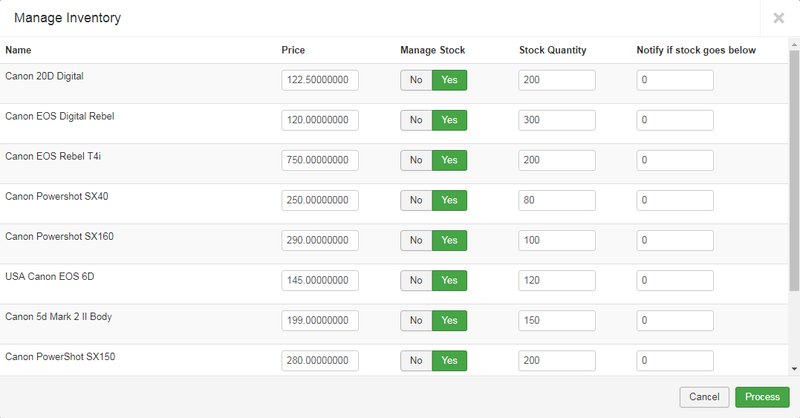 From version 3.2.0, you will be able to create an Out of stock label to assign to out of stock products automatically. - Export products improvement: Add product custom fields to export files (CSV and XML). - Add the feature to use original images instead of resizing. Thanks for using our EShop Shopping Cart extension and continue supporting our developments. Sincerely, Giang from OS Solution. 1. Joomla 3.9 fully compatible. As you maybe knew, Joomla 3.9 stable was released at 30 Oct 2018. This version 3.2.1 of EShop was release to make sure that it is fully compatible with Joomla 3.9. So after updating Joomla to latest version 3.9, please also update EShop to latest version 3.2.1. Joomla 3.9 support Invisible ReCaptcha plugin and EShop 3.2.1 also support it now. So both of ReCaptcha and Invisible ReCaptcha are supported by EShop now. - Fix a small on EShop Products Filter module when it is in Manufacturer page. - Fix a small issue with changing products quantity on the filter results list. - Fix the Continuing Shopping URL when adding products from the filter results list. 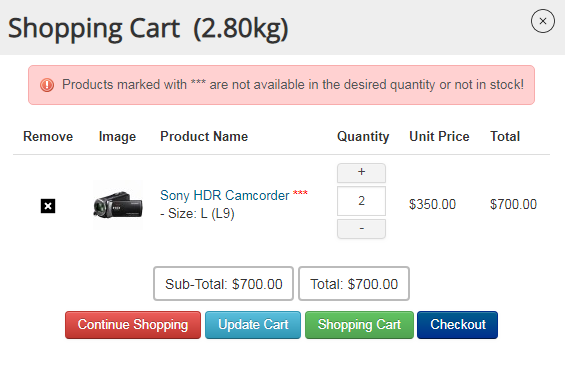 - Add configure option to show total weight at Checkout. - Display number of products column for each category on the Category Manager. - Orders Manager improvement: Add Filter by Manufacturers and Filter by Payment methods. - Fix small issue of EShop Category content plugin and EShop Product content plugin. - Update EShop Sisow payment plugin to make it works with latest version of EShop. Add a new configure option called "Always Generate Invoice" under EShop -> System -> Configuration -> Invoice tab. By default, the system only generates invoice for the paid orders. If you set this to Yes, then the system will generate invoices for every orders, whether paid or pending. So with this new option, you can generate the invoice for orders with offline payment if you want. 3. PayPal Payment Plugin improvement. - Pass customer's shipping address to PayPal to use for Shipping label in PayPal. 4. Some small bug fixes. - Fix small issue with payment methods filtering in Orders Manager. - Fix small issue with count number products in Categories Manager. - Fix small issue with search plugin. - Add full of product information fields to export. - Besides the ability to export products data into CSV and XML format, you can also export into XLSX format now. 2. Add Coupon for Free Shipping feature. So when you create a new coupon code, you will have option to specify the coupon is for free shipping or not. If yet, then when coupon code is used, the free shipping option will be available. 3. Allow edit product custom fields from configuration. Under Configuration of EShop, you are able to edit product's custom fields easily now under Product Fields tab. 4. Display Product Custom Fields to Table Layout. If the products in your store has custom fields information, then you can choose any fields to display them on Table Layout of products list. 5. Some small bug fixes. - Fix small layout issue with Zoom Image in mobile. - Fix small layout issue with social sharing buttons. - Update SagePay payment plugin to work with PHP 7+. With Product Custom Fields, can they only be text fields or can you add other types like textarea for example? You can add text fields, textarea field, select box, radio box, checkbox, etc. Hello, can you post the updates in their own thread, so I don't have to search to find them?